This information is generally accepted for all Husaberg motorcycles. There are tuning details in Engine Tuning, Carburetion, and Tuning Peripherals. And there is suspension information in Front Suspension, Rear Suspension, and Handling, while reliability is covered throughout this Wiki. 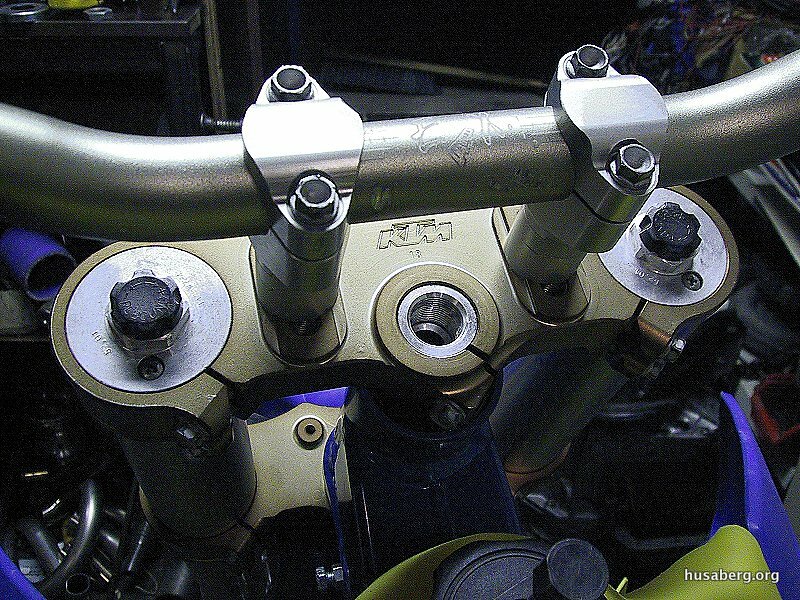 I’m 5’10” and 200 lbs., and the bars are best ‘near’ and on 1-1.5″ tall spacers for which the KTM bar clamps are ideal. Chop 1″ off each end of the bars for better tight woods. the taller the seat-the narrower the tank! with the tall seat, high bar combo: the leg can stay by the tank. 9 liter tank = 2 Imperial gallons = 2+ USA gallons. Good for 3 hours on 14/51 gearing and Keihin jetting done. Less 15-30 minutes for Dell Orto. It’s unfortunate, but you have to over-tighten the spindle screws. For 2003+ Husaberg motorcycles, no adjustment needed. This has been known as the Husaberg’s achilles heel for many years and neither the factory nor the after sales people have done anything about it. Along with the raised bars and the tall seat though you can try to narrow the tank using a heat gun. First, stick the tank on the exhaust of the car for 10 minutes (with the taps open) then lay the tank on it’s inner face and use a heat gun. Press the flank down with a broad piece of wood, clamp down and then heat…. the tank will fold in slightly, and capacity will drop to 8 liters (from 9). It makes a nice difference and saves money! Improve handling at crawl speed, and you’ll have a Rolls Royce type ride down those bumpy straights! Fit is easy but need to make a 3mm spacer; 29.5mm i.d (50mm o/d). KTM cup; L45410 is same as L44610. Bearing code is; L45449. Use/order KTM seals. Forks have been dropped through by 15mm. Fitment and feel. Move to left of cylinder head. Start, rev the engine, and go. Turn choke off with left hand while moving. Worth it. Dust is a major problem. In a 2 + 2 race, change during lunch on a dusty day. The engine will make a “hunting” noise when the air filter is full. Where does the mud collect? The mud gets very bad around the front sprocket and around the rear shock area. There’s no easy answer. Mousses are the way to go, hard to fit, but should last two amateur seasons. No air pressure and no punctures either. You’ll get much more grip, more wear, but worth it to the ‘up-and-coming’ racers. The designs are all poor. How much mud do you want to take home?